Most people say they would like to die quietly at home. But overly aggressive medical advice, coupled with an unrealistic sense of invincibility or overconfidence in our health-care system, results in the majority of elderly patients misguidedly dying in institutions. Many undergo painful procedures instead of having the better and more peaceful death they deserve. AT PEACE outlines specific active and passive steps that older patients and their health-care proxies can take to ensure loved ones live their last days comfortably at home and/or in hospice when further aggressive care is inappropriate. 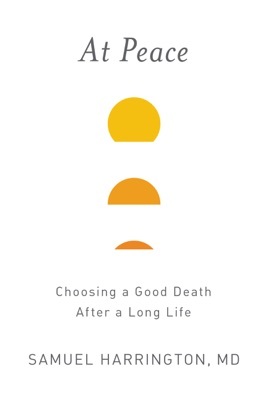 Through Dr. Samuel Harrington's own experience with the aging and deaths of his parents and of working with patients, he describes the terminal patterns of the six most common chronic diseases; how to recognize a terminal diagnosis even when the doctor is not clear about it; how to have the hard conversation about end-of-life wishes; how to minimize painful treatments; when to seek hospice care; and how to deal with dementia and other special issues. Informed by more than thirty years of clinical practice, Dr. Harrington came to understand that the American health-care system wasn't designed to treat the aging population with care and compassion. His work as a hospice trustee and later as a hospital trustee drove his passion for helping patients make appropriate end-of-life decisions.